When your goal is healthy aging, waist size matters. Chubby bellies may be cute on babies, but a large waist size in adulthood is linked to a host of serious disease risks. Different from visible subcutaneous fat stored just beneath the skin, visceral fat is found deep within the abdominal cavity, where it fills in spaces between vital internal abdominal organs, including the liver, pancreas, and intestines. This deep belly fat is metabolically active, functioning as an endocrine organ and secreting hormones and other chemicals associated with increased risk of developing age related diseases. Visceral fat accumulation substantially increases cardiometabolic risk factors, such as high blood pressure, blood sugar, and triglycerides, as well as low HDL cholesterol. Middle aged spread or the tendency to gradually gain weight in mid-life, may seem like a normal consequence of aging. 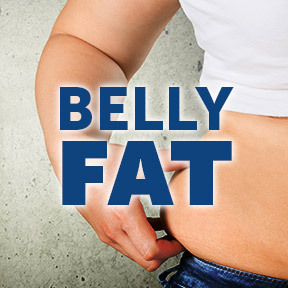 However, where we carry that weight matters, as a growing belly likely results from accumulation of both types of fat. Overall weight gain, as well as the subcutaneous fat that accumulates on the hips and thighs, appears to be much less health damaging than visceral fat. Biologically active visceral fat cells disrupt the body’s normal balance, or homeostasis, and increase cardiovascular disease risk by releasing immune system chemicals known as cytokines. These and other biochemicals are believed to have deleterious effects on insulin sensitivity, blood pressure, and blood clotting. Visceral fat is directly linked to insulin resistance and glucose intolerance, as well as higher LDL and total cholesterol, and lower HDL cholesterol. Without an MRI, it’s hard to determine the amount visceral fat being stored. Research shows that belly size or waist measurement is a reliable indicator of the health risks linked to visceral fat. Those with a large waist size, and consequently a larger amount of visceral fat, may have increased risks of heart disease, type 2 diabetes, Alzheimer’s disease and certain cancers, including breast and colorectal cancers. Fatty liver, in particular, seems to highly predict whether an individual will develop metabolic issues, as even those who have a normal BMI can accumulate a dangerous amount of visceral fat. The good news is that visceral fat yields fairly easily to moderate-intensity exercise and diet, while subcutaneous fat is much harder to lose. Abdominal crunches can tighten abdominal muscles but won’t help rid visceral fat. To reduce overall and visceral fat, as well as metabolic risk factors, one needs to be physically active most days of the week. Even small amounts of weight loss can have a significant impact on disease risk. Know your numbers including your waist circumference and blood pressure, blood sugar, triglyceride, and cholesterol levels. Exercise is key to preventing and losing belly fat. There’s no way around it, diet alone is not enough to reduce deep abdominal fat accumulation. Studies have shown that a brisk, 30 minute walk, six days a week prevented more belly fat accumulation, and that doing more, not harder, exercise worked best to lose belly fat. Add more healthy plant-based meals to your diet, including fresh fruits and vegetables, fish or vegetable proteins, and high fiber, nutritious whole grains, such as buckwheat, quinoa and bulgur. Waist Circumference: For men, low risk 37” or less. High risk, greater than or equal to 40”. For women, low risk 31.5” or less. High risk greater than or equal to 35”. PGX® Weight Loss Meal Replacement French Vanilla by Bioclinic™ Naturals: This delicious and satisfying meal replacement alternative helps curb appetite and prevent food cravings with supportive nutrients for blood sugar metabolism. The low glycemic load and index helps to normalize post-meal hyperglycemia and increases satiety, potentially promoting a lower caloric intake. Provides 25 g of undenatured whey protein per serving. Wheat, yeast and artificial ingredient free. Also available in Double Chocolate and Very Strawberry flavors. PGX® Daily Softgels by Bioclinic™ Naturals: This clinically studied polysaccharide proprietary complex provides three viscous fibers shown to reduce post-meal glucose concentrations and help improve glucose tolerance. Gluten, wheat, yeast, egg, dairy, tree nut, sugar and artificial ingredient free formulation. CLA Trim 1000™ by NuMedica®: This Non-GMO pure form of Conjugated Linoleic Acid (CLA) has been shown in clinical trials to support healthy body composition by aiding the reduction of body fat, while promoting lean muscle mass. Gluten, wheat, soy, fish, shellfish, milk, egg and artificial ingredient free. Berberine 500 mg by Integrative Therapeutics: Used traditionally in Chinese and herbal medicine for centuries, Berberine has been clinically shown to aid blood sugar, insulin and lipid metabolisms, as well as provide support for cardiovascular and metabolic functions. Gluten, wheat, corn, soy, and dairy free, vegetarian formulation. Super HCA™ by Douglas Laboratories®: Super HCA provides 1400 mg of high quality garcinia cambogia extract sourced from tropical fruit in support of normal appetite regulation and healthy weight management. Gluten, soy, dairy, wheat, yeast, corn, sugar, and artificial ingredient free, Non-GMO formulation.